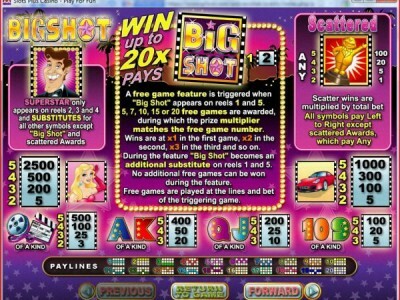 The Big Shot slot machine is another product of the Real Time Gaming company. It is one of their more complex slot machines, as it comes equipped with 5 reels and as many as 20 pay lines. The more coins you put in as you place your bet, the more pay lines are automatically activated, so automatically increasing your chances of raking in a major win. This slot machine has a great number of bonus features, starting with the basic wild symbol, the scatter symbol, the random progressive jackpot feature and also something called the Big Shot Free Spin Bonus Round. Each of them greatly increase the odds of you winning something big. The maximum amount that the jackpot offers is 2,500 coins, and beyond that, there is more to be won with the progressive jackpot feature. The wild symbol is represented by the symbol of a super star, and the Gold Trophy Award functions as the scatter symbol. 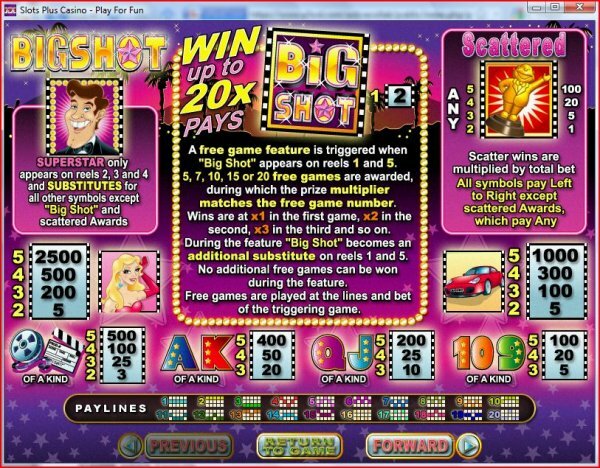 The progressive jackpot is activated randomly, and its current value is displayed constantly on the screen. The more you bet, the higher will be your chances of activating this particular feature. Finally, free spins, as many as 20 of them, can be awarded with the free spin bonus round.